UPDATED Sky, Grass and Dirt Handwriting Strips, now with numbers 1-10. A great way to support students with placement and formation of letters (Victorian Modern Cursive) onto lined (dotted thirds) paper. 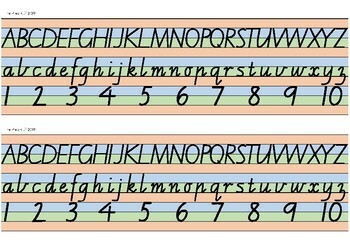 There are 2 versions in this pack - one bold and the other regular Victorian Modern Cursive. 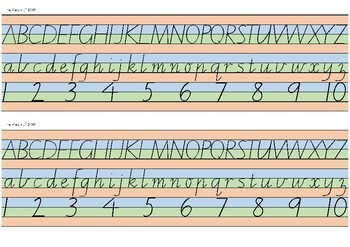 Each set has both the Uppercase and Lowercase letters on the strips, with additional numbers. Print onto cardstock. Cut in half so that you have two sets! Laminate for durability. These can be placed on desks for students to refer to as they write.